This brilliant, distinctive toadstool is hallucinogenic. Eating it can distort perception and cause objects to appear to expand and contract, making this mushroom at home in Wonderland. 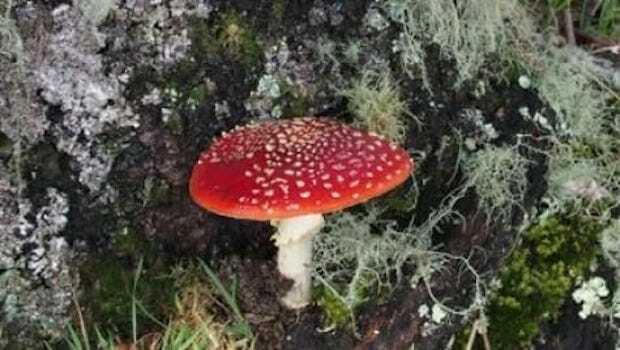 Fly amanitas inspired the magic mushrooms in Super Mario Brothers and are littered throughout art and literature. Other members of the Amanita genus, like the death-cap mushroom, are fatal. Yet these fanciful and sometimes dangerous mushrooms are also friendly — at least to plants. Most Amanitas can only survive by closely partnering with plants, providing their roots with minerals and nutrients in exchange for sugars. This symbiosis evolved more than 50 million years ago and helps forest ecosystems thrive. Anne Pringle, a professor of botany and bacteriology at the University of Wisconsin–Madison, researches what genetic changes drove some Amanitas away from their ancestral, decomposing lifestyle toward this intimate relationship with plants. In new work, Pringle and her collaborators show that gene loss — not the evolution of new genes — helped drive this major change in the mushrooms’ lifestyle. The team also suspects that they’ve identified a species of Amanita that is on its way to evolving a new symbiosis with plants. In all, the results provide further evidence that symbiosis may be a lot easier to develop than scientists once thought. The new study was published Sept. 18 in the journal Molecular Biology and Evolution. Jaqueline Hess of the University of Vienna led the study, with collaborators in Norway, the Netherlands, France and Saudi Arabia. To get at what separated symbiotic from free-living Amanitas, the researchers sequenced the genomes of three symbiotic Amanita species — including the fly amanita — and three close relatives that aren’t symbiotic. The genomic sequences allowed them to reconstruct the evolutionary paths that led to the fungi’s different adaptations. “We went into this thinking we’d find commonalities between the three symbiotic Amanitas,” Pringle says. But despite their similar lifestyles, symbiotic Amanitas looked vastly different from one another on the genomic level. Some symbiotic species had almost double the number of genes as their similarly symbiotic relatives. The symbiotic mushrooms seemed to take different genomic paths after they first diverged, developing unique ways to tailor their partnership with plants. Earlier research on other families of mushrooms had suggested that one defining characteristic of symbiotic lifestyles was the loss of enzymes capable of degrading the cellulose-laden walls of plant cells. These genes are crucial for decomposers eating through leaf litter. But for fungi that associate with plants and must avoid harming their partners, cellulose-digesting enzymes are only a liability. So when Pringle, Hess and their team looked at this group of digestive enzymes, they were surprised to find that the free-living species Amanita inopinata was missing these genes. Although symbiotic Amanita mushrooms had indeed lost this suite of digestive enzymes, Amanita inopinata’s lack of them meant the researchers couldn’t link this loss to symbiosis itself. Pringle says the unexpected absence of cell wall-digesting genes in Amanita inopinata’s genome may actually be a clue pointing to evolution at work. If symbiosis only develops once fungi let go of these digestive enzymes, the researchers reason, then Amanita inopinata may be primed to evolve a closer partnership with plants. Not quite symbiotic, perhaps not fully independent, Amanita inopinata seems to be “stuck between two worlds,” says Hess, who began the work while a postdoctoral researcher in the Pringle lab and is now a senior scientist at the University of Vienna. The evolution of Amanita inopinata — “the unexpected one,” in Latin — and the other Amanitas also seem to support a developing consensus that symbiosis, once thought to be exceptional, may actually be easy to evolve. The researchers didn’t find that Amanita needed to develop a new, complex suite of genes in order to start partnering with plants. Instead, just letting go of a few once-vital genes may be sufficient to forge new relationships in nature. “The story of making friends is one of loss,” says Pringle. Previous post: How bad will the flu be this season?